MOSCOW: After soaring without hitting an air pocket since July 21, 2016, Spain hurtled into crisis on the eve of the World Cup start. Julen Lopetegui who replaced Vicente Del Bosque as coach on the above date, was sacked on Wednesday at Krasnador, Spain’s training base for Russia 2018. Lopetegui had a fine record, remaining unbeaten in 14 of 20 games, even fashioning Spain to be one of the favourites at Russia but failed to complete even two years in office. Fernando Hierro, the team’s sporting director, has been appointed as Spain’s head coach and will lead their campaign in Russia. A former Real Madrid mainstay, Hierro’s last coaching job was with Spanish second division side, Real Oviedo in 2017. The former Spain and Real Madrid captain guided Oviedo to an eighth-place finish. Real Madrid’s hasty announcement of Lopetegui AS Zinedine Zidane‘s successor on Tuesday, stirred a hornet’s nest. The Spanish base at Krasnador, on the Kuban, turned into a beehive of negotiations and counter intelligence activity, demoting the small matter of a World Cup game against Portugal in two days’ time to the lowest on the priority checklist. Moments after Real’s announcement, Spanish Football Federation president Luis Rubiales flew out of Moscow late on Tuesday night, leaving the FIFA Congress to take charge of the situation. 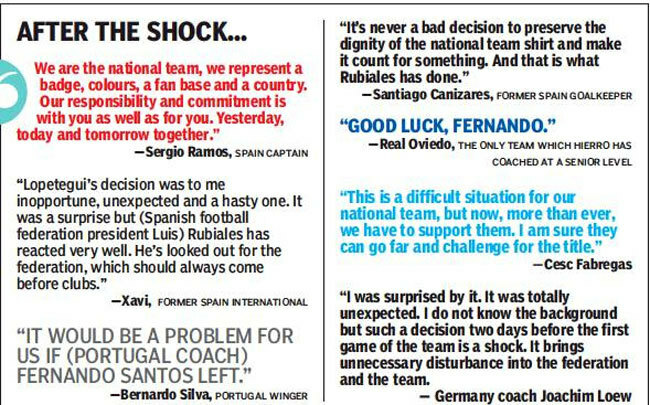 A twice-delayed press conference followed on Wednesday and the declaration, that Spain dreaded most, was made. “We have been forced to dispense with the national coach. We wish him the best of luck. We will have to carry on with the work he has developed,” Rubiales said. “The problem is how things have been done with the total absence of participation of the Spanish Football Federation, that is something we cannot ignore. Lopetegui is an impeccable professional but the process is important,” the president said. He added, “I do not feel betrayed. While Lopetegui was with us, he has done an impeccable job.” Reports from Krasnodar say that captain Sergio Ramos argued hard for Lopetegui to stay in charge for the duration of the Cup. The sacking became the talk of the World Cup. The German team, training on the outskirts of Moscow, was also avidly discussing the surprise development. Coach Joachim Loew said, “Lopetegui’s dismissal was a huge surprise for me. I do not know all the reasons, but in itself such a situation the day before the World Cup starts is a serious shock, because it can destabilise the Spanish team. I hope that the dismissal will not affect the preparation of the team for the World Cup matches”. Loew wished Hierro luck. Krasnodar, meaning the ‘gift of the reds’ in Russian, assumes a whole new meaning. La Rojas has given the World Cup something to really talk about, at last.